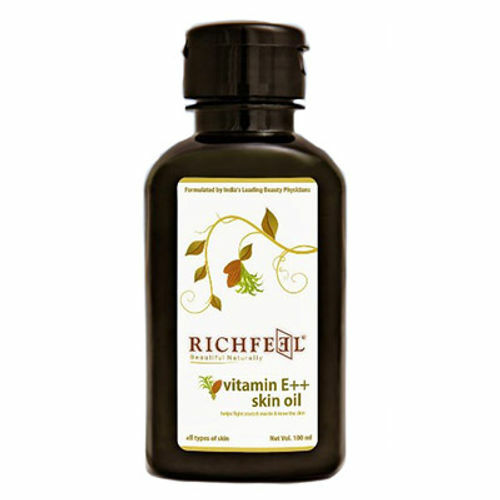 This Richfeel Vitamin E ++ Skin Oil is special formulated for stretch marks. It effectually gets rid of and lightens stretch marks that are caused by pregnancy, weight loss and gain. Efficiently softens the skin and makes it firmer. It is nourished with Vitamin A, Vitamin E as well as extracts of Walnut, Almonds, wheat germ and Calendula. Additional Information: Richfeel was founded in 1986 by two visionaries Dr. Apoorva Shah and Dr. Sonal Shah, India's first certified trichologists. They are experts in the areas of hair, scalp and skin care. Explore the entire range of Stretch Mark Cream available on Nykaa. Shop more Richfeel products here.You can browse through the complete world of Richfeel Stretch Mark Cream .Alternatively, you can also find many more products from the Richfeel Vitamin E++ Skin Oil range.